If you’re anything like me, you will be well acquainted with the long process of scouring TripAdvisor and local guides for food recommendations in every new city you travel to. 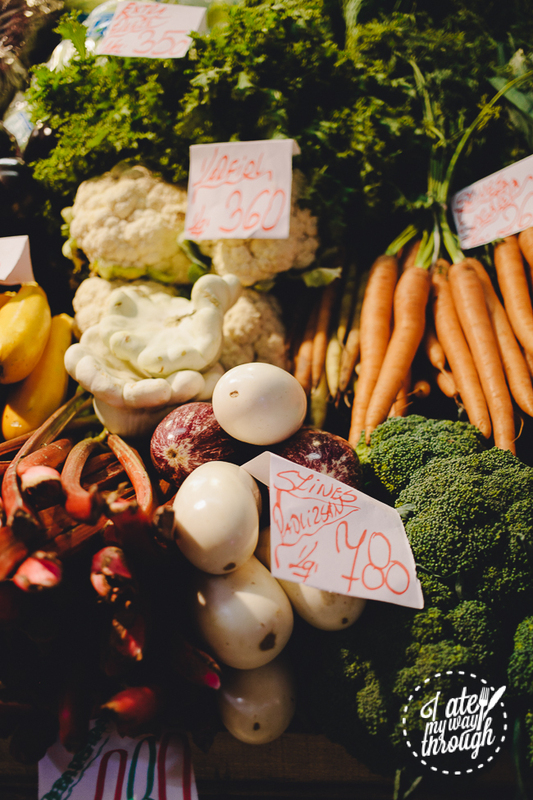 But I have to say – when you’ve been planning every aspect of an itinerary for weeks, it’s equally comforting to put your fate in the hands of a food tour organiser and know that you’ll be eating well, at least for a day. And boy, does Taste Hungary’s Culinary Walk deliver with style. At more than 4 hours long, it’s a thorough, professional exploration of Hungarian cuisine and cultural tour that will leave you much more knowledgeable about your surroundings and very, very full by the end (consider this your breakfast, lunch and dinner if you’re me, or at least your breakfast and lunch). Our guide was Zsofia, whose journalism background meant that she merged history, culture and food knowledge seamlessly into her explanations. She was friendly, personable and had interesting things to say about everywhere we went. We began on the top floor of the Central Market Hall, which was built in 1896 to celebrate the country’s millennium. 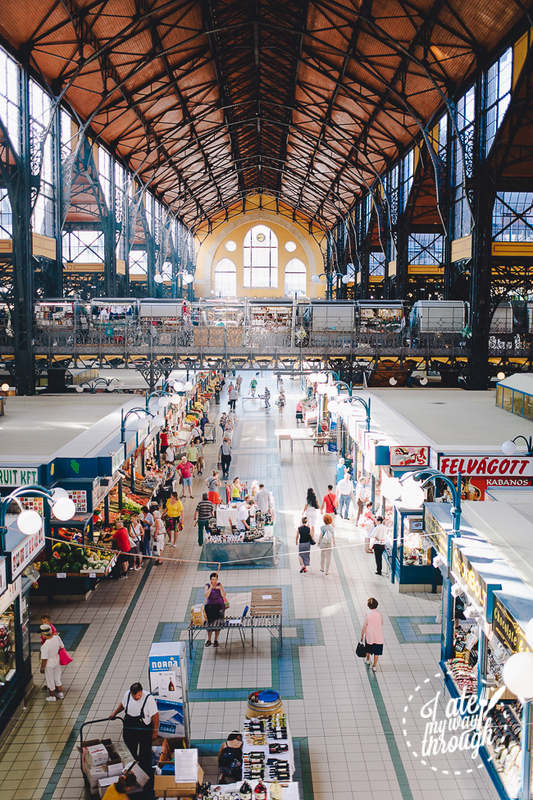 It’s the largest marketplace in Hungary, where Budapest locals go to shop, and the floor is slightly sloped to make it easier for vendors to hose down. We started on the top floor of the market, which is where old Hungarian men get sidetracked while on shopping trips for their wives, and downed a shot of Unicum to start. 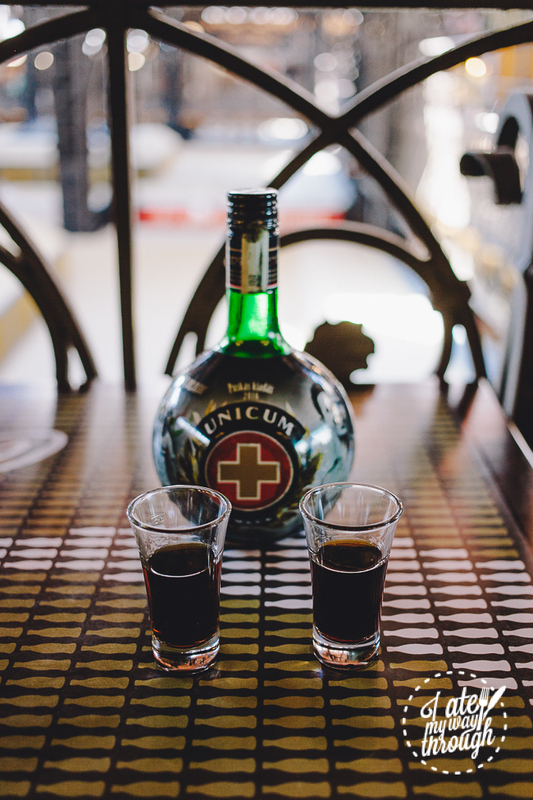 Unicum is a famous, barrel-aged alcoholic beverage that has been used to aid digestion since the 1790s. The secret recipe was prepared by Dr Zwack, the doctor to the royal Hapsburg family, and definitely reminds me of strong medicinal herbal drinks, with an alcoholic twist. 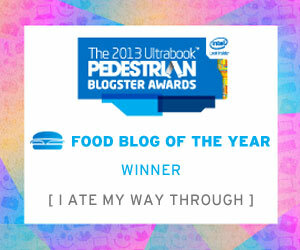 At the very least, they cleared up the sinuses – and whetted the appetite because there was going to be food. A lot of food. 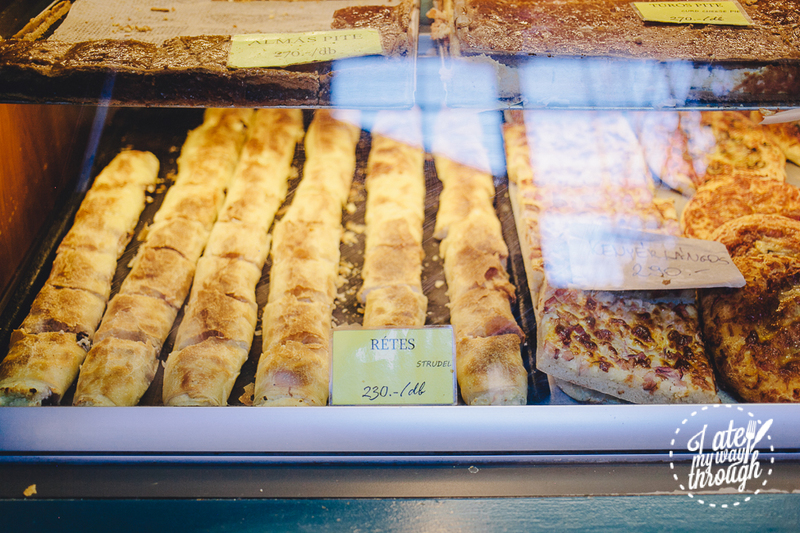 Retes are strudel and filo pastries introduced in Hungary by the Turks and is a must-try if you ever visit the Central Market Hall. 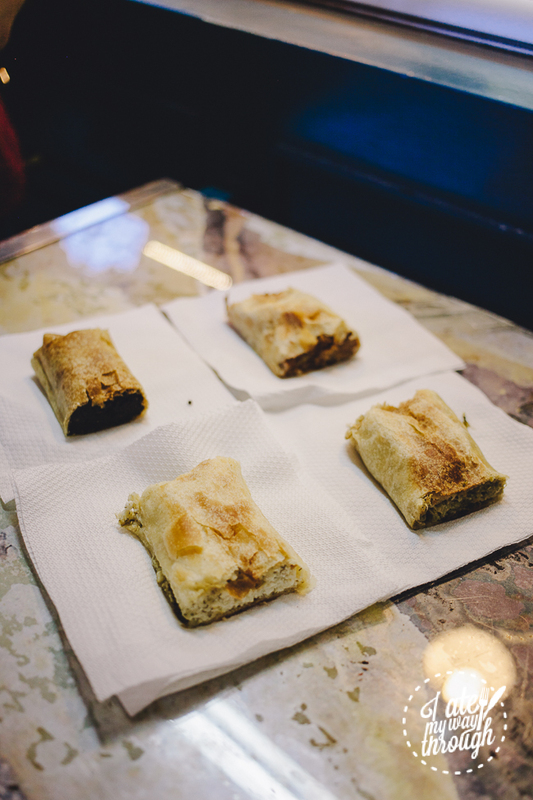 The generous fillings are separated and wrapped in sheets of thin, flaky pastry layers. All four flavours I tried with my companions were quite amazing but the savoury cabbage flavour was probably my favourite, full of fragrant, buttery flavours. The slightly tart note in the apple strudel was probably why it was my favourite sweet pastry. Zsofia then took us around the various stalls of grocers and butchers that fill the bottom floor of the Central Market Hall, pointing out different types of pasta, vegetables (white eggplants!) and spices like Hungary’s distinctive sweet paprika, which was used as a substitute for pepper when it was very expensive as Hungary was not part of the spice trade. It’s little tidbits of trivia like these that makes food tours so great for me. 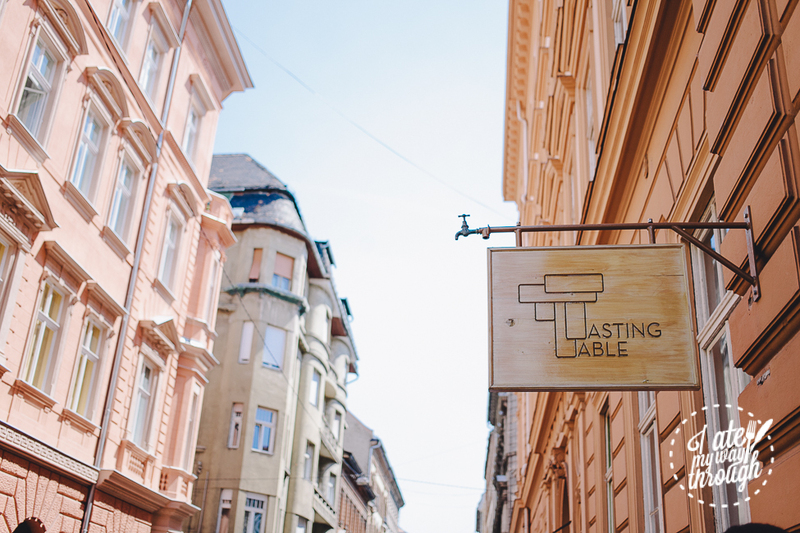 Our next stop was to Taste Hungary’s own store, Tasting Table, for a wine tasting. 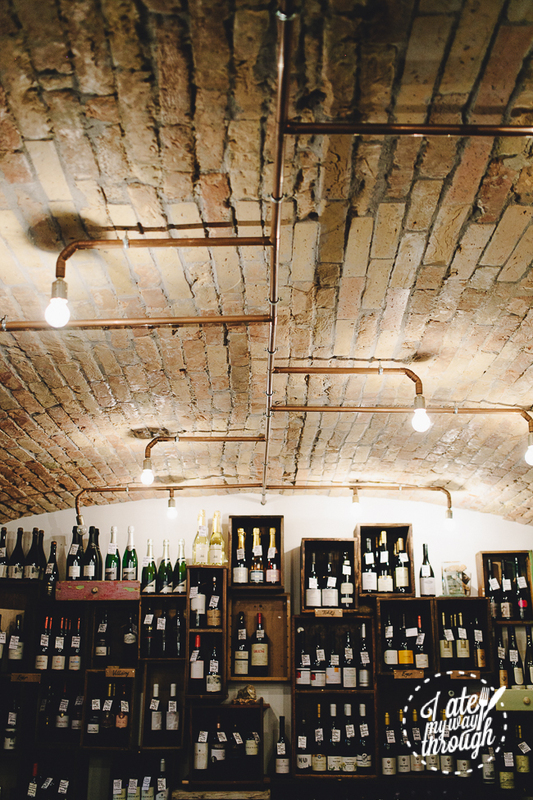 Located on one of the prettiest streets I’ve ever seen, the store itself is incredibly charming – built into the ground in a rustic, almost cave-like setting, filled to the brim with bottles. It’s a great place to spend an evening and, in our case, was also great as a way to escape the summer heat in the afternoon. Our sommelier really took care to give us a detailed explanation of each wine we tasted. 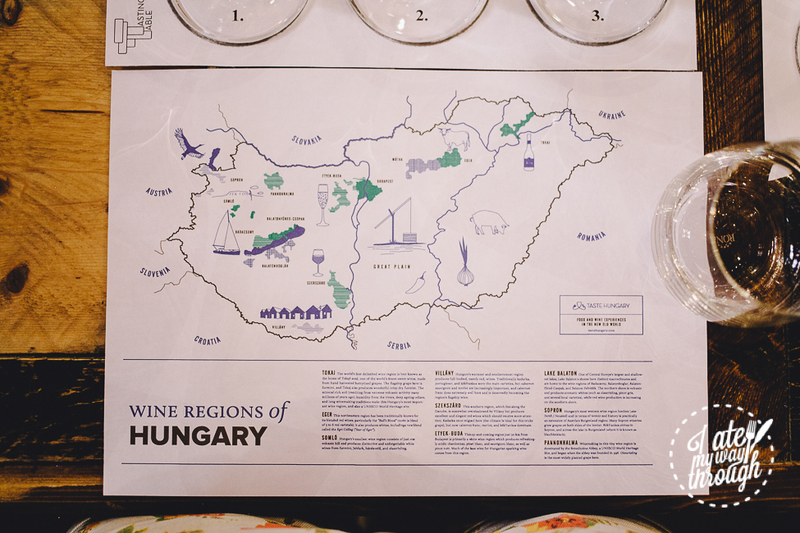 Wine offered in Budapest is almost exclusively Hungarian, produced in the Tokaj region of the country and is almost 70% white. 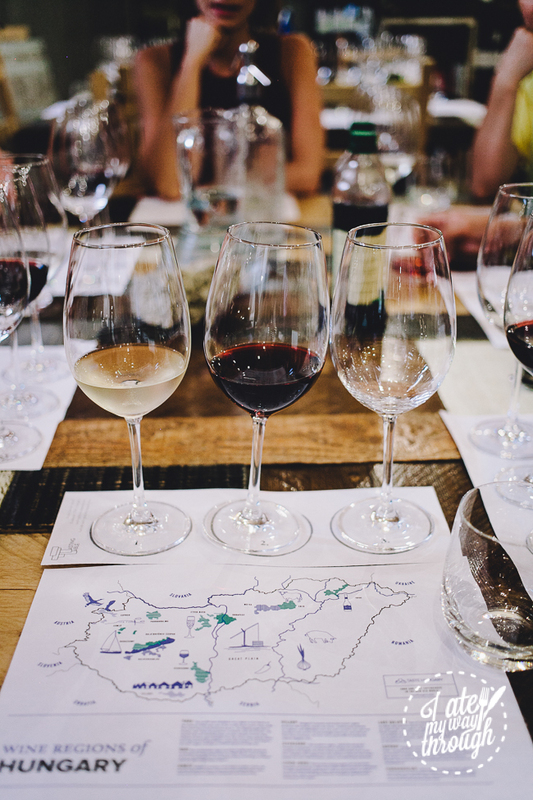 Summer is a great time to go because the berries are in season, and Hungarian wine is not exported very often so it’s a rare chance to sample said wines. I found the white Tokaj very light and refreshing in the summer heat and easy to drink. The red Bolyki, also known as the ‘bull’s blood of Egar’, was strong and acidic but tapered off into a sweet finish. My favourite was probably the dessert wine, the 2009 Royal Tokaji picked berry by berry from the Villany region in Hungary. Its quite sweet but not in a cloying way and it was very refreshing. 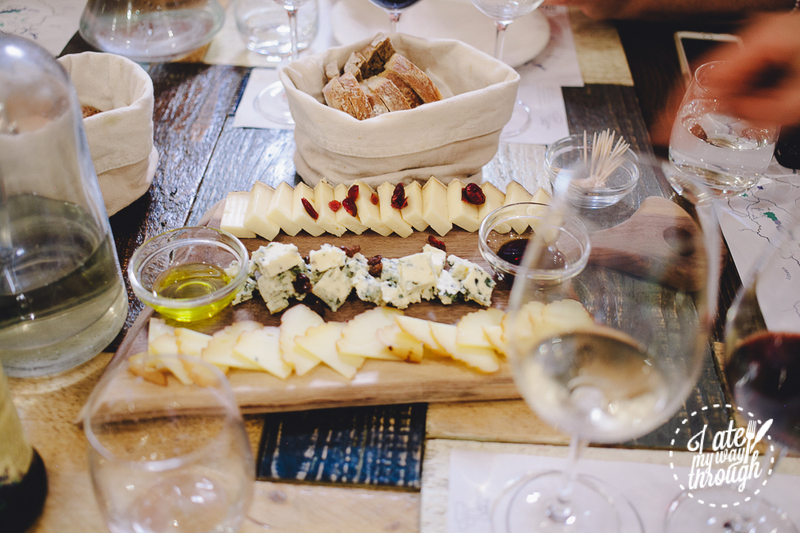 We complemented the wines with tasting platters of salami and pork crackling, as well as a selection of cheese and crackling scones from the Central Market Hall. 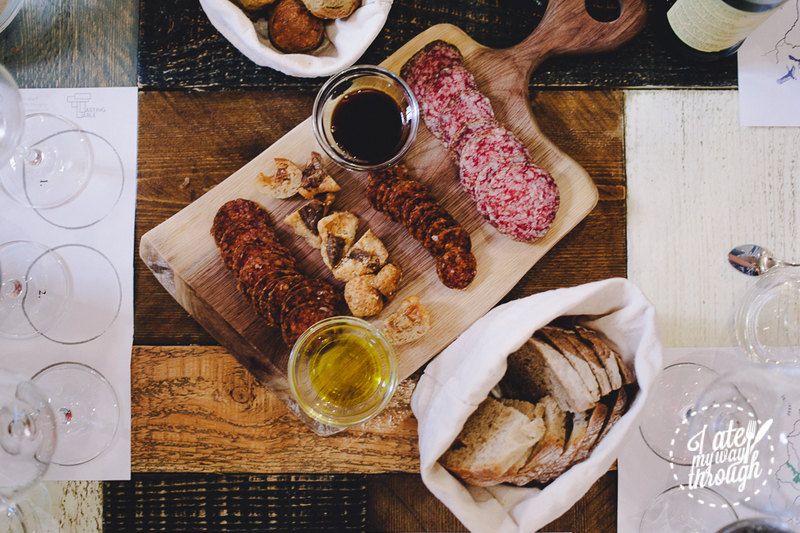 I recommend the grey beef salami, which had a vivid meaty umami flavour accompanied by a peppery kick, and the soft mountain cheese, which has a subtle, creamy flavour that actually grows more vivid and sweet on the palate as it lingers. Also, dipping plain, fresh bread in pumpkin seed oil is the definition of heaven. I have talked about this previously, but if you’re in a city like Budapest, walking is truly the best way to get around. 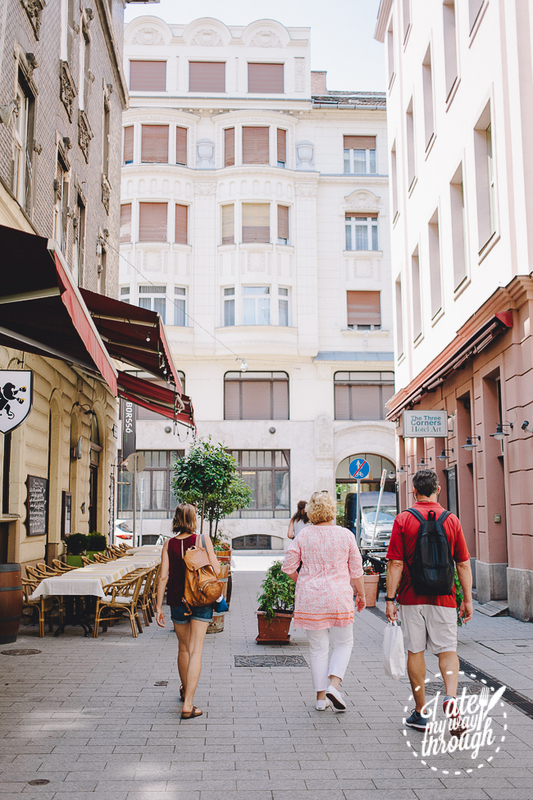 Taste Hungary’s food tour covers a different section of the city compared to Coffee Houses, so if you’re strategic about it, you can organise the other sightseeing aspects of your itinerary around the tours. Life’s short and chocolatiers close from 12 – 1PM for a lunch break so eat dessert first. Rózsavölgyi Csokoládé, an artisanal chocolate store, specialising in dark chocolate was truly a gem of Budapest, hidden away in a small alley off the main roads of Budapest. I absolutely wish I had bought some of the chocolate as souvenirs (though, to be fair, they would probably not have survived summer and a further 2 weeks of travelling). 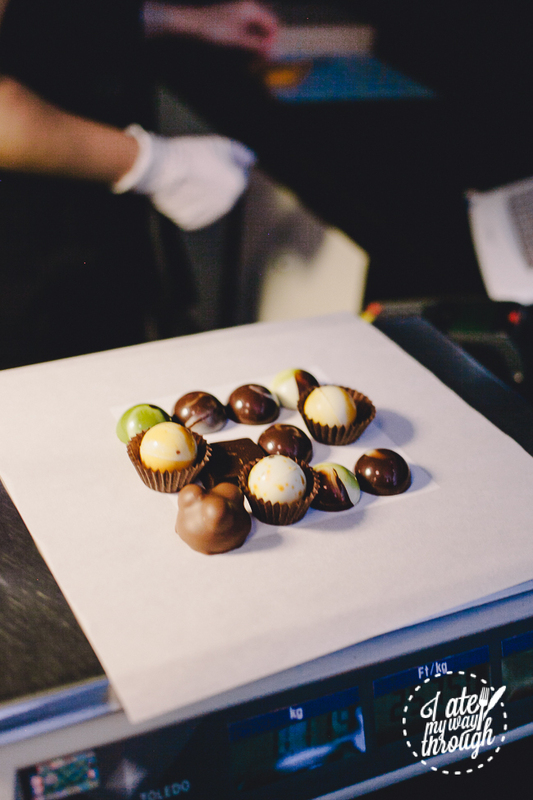 We were able to choose two chocolate ganache bon-bons to sample as part of the tour. I absolutely recommend the Tarragon. You would not think a filling based around a type of herb would work in a dessert but it gave it a truly unique, rather refreshing taste that complemented the silky smooth, rich dark chocolate very well. 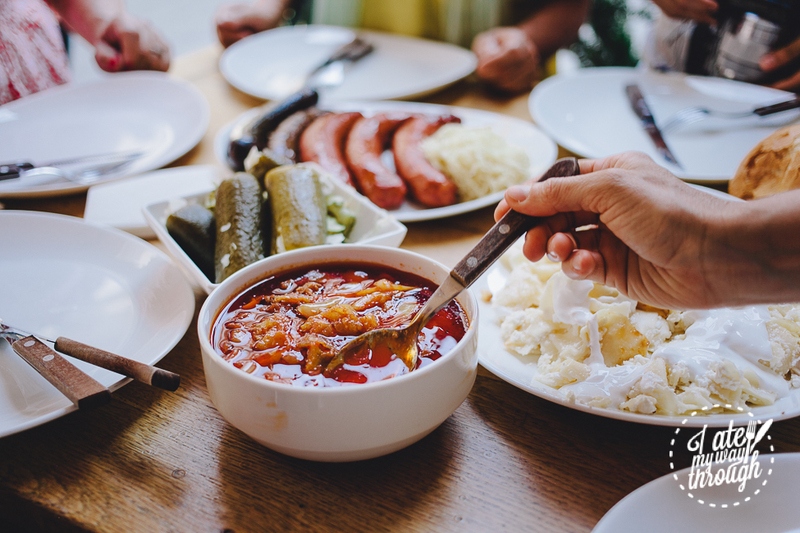 A traditional culinary tradition in Hungary (and other countries in Central Europe for that matter) centres on the local butcher, where locals will often congregate at small standing tables to eat grilled sausages and side dishes. It was clear from the crowd that Belvárosi Diszjótoros is a local favourite. When in Budapest, do as the Budapestians do so, full to bursting, we had the final meal to cap off our tour. 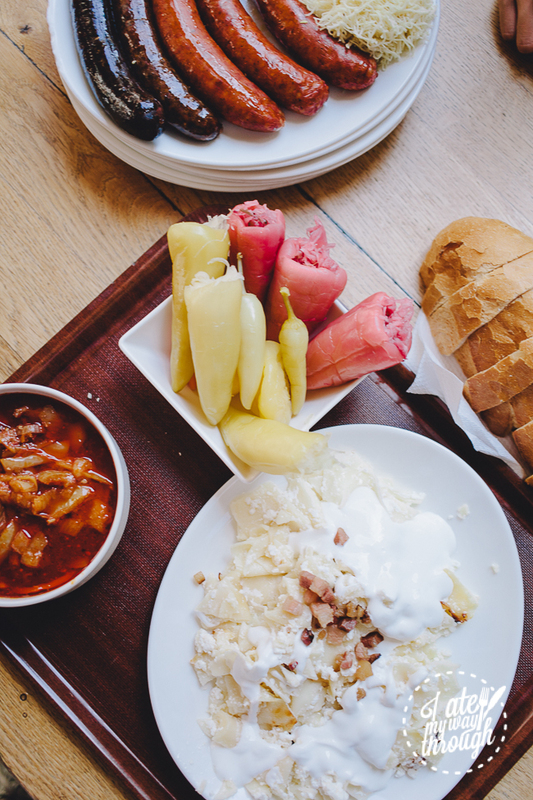 This involved a generous platter of paprika, liver and blood sausage, vividly coloured pickles stuffed with sauerkraut, a pasta, potato and sour cream dish (with bacon sprinkles), as well as a summer ratoutouille soup. For those wondering – blood sausage and liver are quite gritty in texture with a strong vivid flavour; it’s perhaps a little strong for my taste but I can see why people might enjoy it. Try it anyway – that’s the travelling MO. If you’ve paid the dollars and the double-digit hour travel to Europe, you really should do your best to have great meals every time. In light of all we ate and learned and walked, Taste Hungary’s tour rightfully deserves its accolades and I would wholeheartedly recommend this tour for those serious about their food. Come with an empty stomach, an open mind and this is an excellent way to spend half a day abroad. 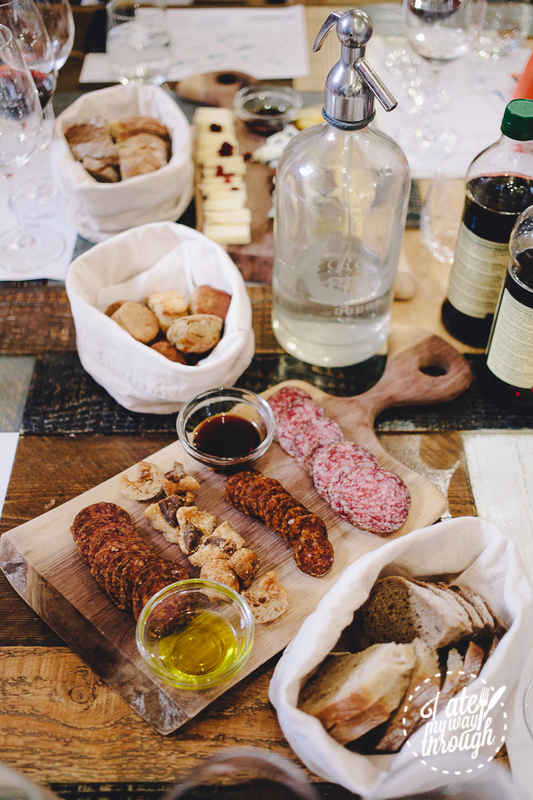 And if this tour doesn’t quite suit you, I have full confidence in saying that you’ll probably find something in their suite of food tour offerings. 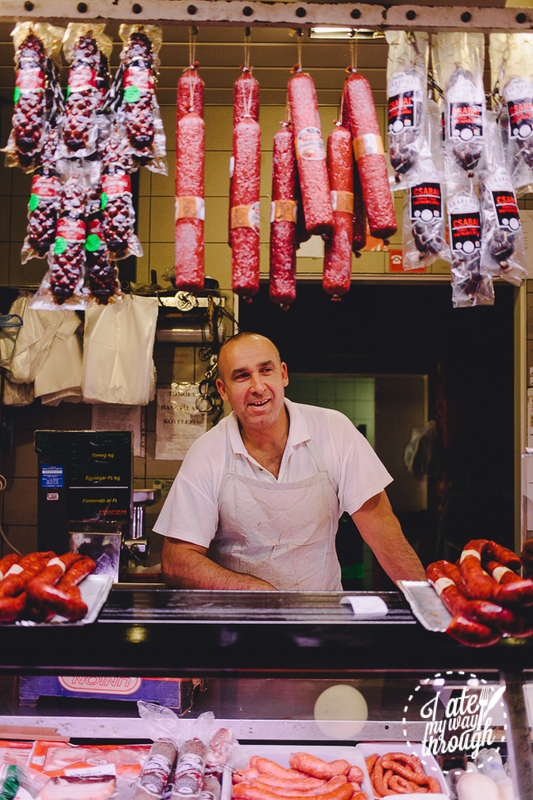 For more information on the Budapest Culinary Walk, go to Taste Hungary.